Yarn: Artyarns Supermerino…I think it was 10 skeins. From lettuce knit. After months and months of sitting, this sweater is finally done. I don’t even remember when I started it…I got the yarn at Christmas, but I definitely didn’t cast on for a few months. And then the knitting was done, but I waited and waited to block it. And then there’s the buttons, which I finally put on today. I think I’m in a finishing mood, so more FOs to come soon! Although there’s no shaping in the body, it’s a close fit and hugs well anyway. The sleeves are nice and long, which I like. I can see wearing this a LOT. Plus, I know that Supermerino wears really well too, so not so much worrying about pilling! Needs a snazzier name, though – suggestions? There may even be a prize involved, or something. I harvested a good couple of burgundy beans from my container garden today! They are the most gorgeous, eggplant-y purple. Picked them a bit big, actually, but I haven’t been home much the last few days. There are quite a few more on the plants to pick in the next few days. And they turn green when you cook them! I had them briefly steamed, with my garlic broccoli and tofu tonight. Yum. Nice cardi! Isn’t it good to not be itched by wool? Your beans look like ones we call Purple King beans. They are one of my favourites cos they are purple and yummy, even though they are beans. Happy birthday for earlier in the week – same day as one of my sisters. very cute sweater! I love the diamonds! OOh! How about “Lucy”, as in Lucy in the Sky with Diamonds? Fantastic as usual! Let us know when you put the pattern up for sale!! I’d call it Espresso. I love that color and it fits you like a dream. I can’t believe there’s no shaping in it! I also love the longish sleeves. Love the sweater, and I can’t wait until the pattern is up for sale! It’s a great cardi! Basic, but still a bit ‘fancy’. I’d call it “Best Friend”, since you can wear it often, also playing on the “Diamonds are a Girl’s Best Friend” song. 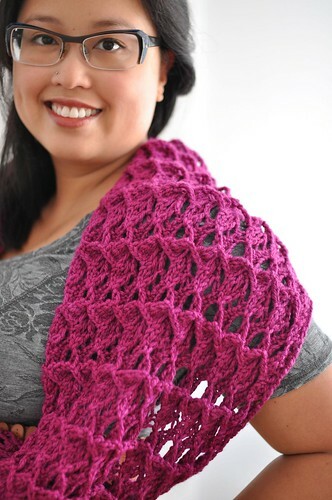 Very pretty cardie! Great job. Diamonds look good on you. Impressive knitting! Great job on that sweater! This one is keeper, ha! Lovely, lovely sweater! Sorry, no clever name suggestions. I’m glad to hear that you think Supermerino wears well, I’ll consider it for my next project! Do burgundy beans taste different than green? How about Chocolate Diamonds? Or Diamonds ‘n Chocolate? Whatever you call it, it’s fantastic looking! I’m behind on the blog reading! Wow! This sweater looks amazing! Lovely. And I am sorry about the veggie garden carnage. It did look rather gruesome. Fabulous!!! Looks fabulous on you! I’ll be looking out for the pattern! I usually only wear pullovers but, that is one fantastic cardigan. I would definitely knit and wear that! I’ll keep checking back for the pattern! Now – there’s – a handknit with style! Genius! It looks great on you! I love that cardi, very cute. I would love the pattern for it.